Photo courtesy of Maria Rapisarda. If you are not a white, Christian, cisgender, heterosexual male, then President Donald Trump’s first month in office has been terrifying. The Indianapolis community responded timely and swiftly with each order that was enacted. Marches and protests, including #NODAPL – which protests the continual building of a pipeline through land that affects the indigenous community – and #NoBanNoWall, have taken place in downtown Indy and the Indianapolis airport. The second hashtag refers to one facet of an executive order signed by Trump, which bans the entry of citizens of seven Muslim-majority countries, as well as a separate executive order calling for the construction of a wall between the United States and Mexico. Just because we are in the “Butler Bubble,” that does not mean the Butler community is not affected. 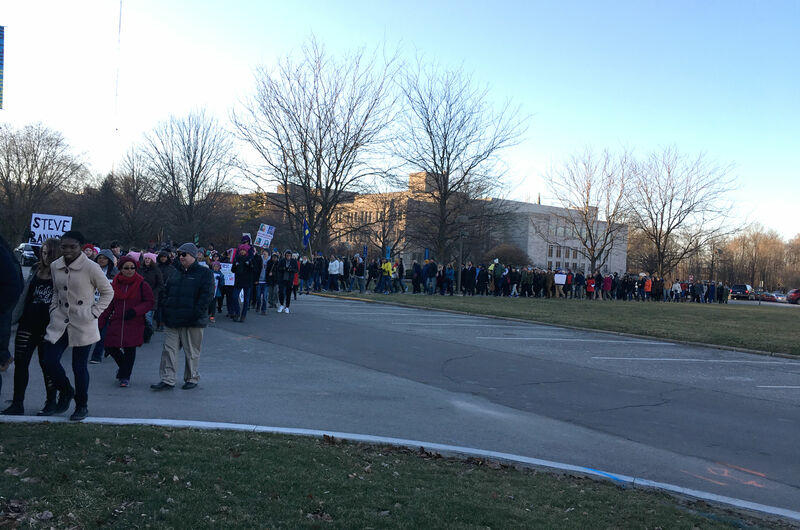 Friday Feb. 4, in the cold afternoon, the Butler community did, in fact, respond. Butler’s Muslim Student Association is filled with students who are particularly affected by the recent executive orders and decided that the best response to Trump’s first two weeks in office was to unify the campus. Sara Abusnaneh, first-year psychology major and executive board member of MSA, said the idea of unity was at the center of this event. In 20-degree temperatures, a crowd began to gather on the strip of grass in front of the west entrance to the HRC. A camera crew had their equipment set up to face a podium, where sophomore biology major and MSA member Maham Nadeem eventually welcomed everyone and thanked them for coming. First-year chemistry major Asif Hossain said these orders affected more people than one might initially suspect. The first we had heard of the Unity Walk was from a fellow student in a classroom. Shortly thereafter, a Facebook event was created and an announcement was posted in the Butler Connection. By the time the event took place, more than 200 people said they were going, and more than 600 people were interested. Wendy Vencel, history and classics double major and junior, said she learned about the walk from Facebook. “I participated in the Women’s March in Washington D.C. and I wanted to continue protesting the current Trump administration, so when I found out that this was happening on campus, I knew I had to join,” Vencel said. She was just one of many students who joined the walk in solidarity with those of the MSA. But although it was a student-led event, they were far from the only types of community members in attendance. Professors and other members of the faculty and staff came to show their support, as well as Kate Morris, the provost and vice president of academic affairs, who fully supported the initiative the MSA students took to unify the entire campus and promised to extend that support even further. Among the leaders of Butler who shared their support for the walk was President Danko and his wife, who were unable to be there but sent good thoughts and wishes for a successful, united afternoon. Other leaders were in attendance too. Among the many guest speakers at the start of the walk were Hazam Bata of the Islamic Society of North America, as well as representatives for Senator Joe Donnelly and Congressman Andre Carson. All three brought the crowd to a defiant applause, especially when it was announced that Donnelly was co-sponsoring a bill to kill the executive order that banned citizens of seven predominantly Muslim countries from entering the United States. After the speakers finished speaking, there was a certain energy that overcame everyone. We walked in solidarity, every single person beside, in front of and behind each other. Some had signs that they held high the entire time. Others waved to cars passing by; they almost always responded by rolling down their windows and honking in support. We realized what an incredible turnout the walk had been when, in front of the pharmacy building on our way back to the HRC, we looked over our shoulders to see that the end of the crowd wasn’t even in sight. There were still people rounding the corner by Jordan Hall. This kind of an event was exactly what it was supposed to be — a unifying one. People from all walks of life joined in that afternoon to show we do stand together and we do care for one another. At the end of the day, we are all human.